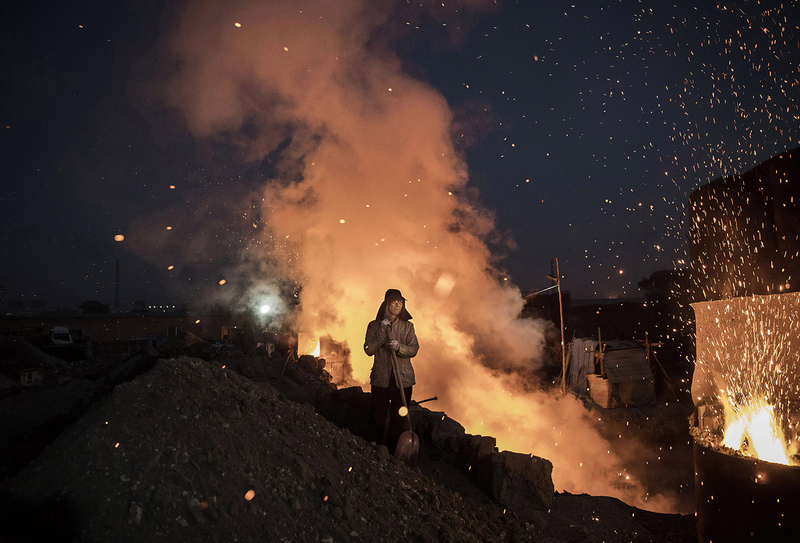 A worker at a furnace at an unauthorized steel factory in Inner Mongolia, November 3, 2016. By Soumya Sarkar, a New Delhi-based writer and editor. This article was first published by chinadialogue. With the U.S. likely to fall short of its Paris Agreement pledge to reduce carbon emissions, a new analysis released last week claims that overachievement by India and China will ensure progress on climate action is not stymied. The U.S., the world’s second-largest carbon emitter, may withdraw entirely from the Paris deal. The decision will likely be taken after a meeting of G7 nations between May 26 and 27. President Trump’s daughter Ivanka and son-in-law Jared Kushner, who are senior presidential advisers, as well as Secretary of State Rex Tillerson, are in favor of remaining, while Environmental Protection Agency chief Scott Pruitt and Senior Adviser Steve Bannon have urged Trump to withdraw, according to multiple media reports. However, lower coal use than expected in China and India is likely to reduce projected global carbon emissions by roughly two to three billion tonnes by 2030. This means the recent rollbacks by the Trump administration are unlikely to have a major impact on global emissions by then, according to a study by Climate Action Tracker (CAT), a joint project by non-profit organizations Climate Analytics and NewClimate Institute, and climate consulting agency Ecofys. “The highly adverse rollbacks of U.S. climate policies by the Trump administration, if fully implemented and not compensated by other actors, are projected to flatten U.S. emissions instead of continuing on a downward trend,” said Niklas Höhne of NewClimate Institute in a statement. The analysis expects a continued slow decline in China’s coal consumption, which has fallen for three consecutive years between 2013 and 2016. India has said in its draft national energy plan that its planned coal-fired power plants may not be needed. If India fully implements recently announced policies, it would see growth of carbon dioxide (CO2) emissions slow over the next decade, the CAT analysis said. The positive developments in India and China outweigh the potentially negative effects on emissions from Trump’s proposed rollbacks in the U.S., estimated at around 0.4 gigatonnes of CO2 by 2030, CAT said. According to the Climate Action Plan outlined by the Obama administration in 2013, the U.S. wanted to reduce its carbon emissions by 26 to 28 percent below its 2005 levels by 2025 by expanding clean energy, energy efficiency programs, and transportation strategies, and by implementing its Clean Power Plan. Much of this seems to have stalled, according to a report by the Washington Post. The CAT analysis says that the slack by the U.S. will be picked up by India and China. China promised in Paris to peak its carbon dioxide emissions by 2030 and increase the non-fossil fuel share of its energy consumption to around 20 percent. India pledged to boost its share of non-fossil fuel energy to at least 40 percent by 2030. New developments in both countries’ energy landscapes, particularly in regard to renewables, have put them ahead of the game in terms of meeting their goals, the analysis said. India’s energy plan released late last year has significantly reduced its projections for additional coal capacity in the years to 2027 by reducing plans from about an additional 230 gigawatts to 50 gigawatts. The South Asian nation, which is the world’s third-largest carbon emitter, expects more than half of its power capacity to come from non-fossil fuel sources by 2027, putting it far ahead of its Paris commitments. China is accelerating its pace of limiting and reducing greenhouse gas emissions, and moving closer to what is necessary to achieve the Paris long-term temperature limit, although a gap still remains, the CAT analysis said. Based on India’s draft electricity plan, CAT calculates that the country will significantly reduce its emissions, and by 2030, its emissions intensity will be 51 to 53 percent below 2005 levels, exceeding its Paris target.